“Animal skulls appeared from the darkness. Some horned, massive, floating, some beaked and eloquent, some with wolf features. Black clad men with scissor hands, butcher knives, and sickening apparatus for weaving bone and making flesh. The only human skulls in the sinister zoonarium were floating around – as if decapitated from the men and borne with malificarum. The laboratorium smelt of chemicals, gore and iron. Finally the full vision is starting to have it’s core elements established. The human sized things will out number the Sky Warriors in the end, and I have three themes of them in the works. The first are the surgical Thralls, followed by the Wyrd Thralls (if the surgeons were gothic, wait till you see them) and martian Thralls. Going into painting the first category I had three goals. And I think it really worked. I also wanted to share a quick WIP, very early days, of their Master. He is in the back burner because I am working towards a list I can start playing with and possibly take to Las Vegas Open in February. And also because he is a giant. The Vulcan model is bigger than any of the other Primarchs, to a point where I needed to build more Sky Warriors to see if he would brake the scale and now I think he might – so the plan needs tweaking. It is thus painful but possible you will never see this configuration of him finished, but the right idea is better than a great idea. 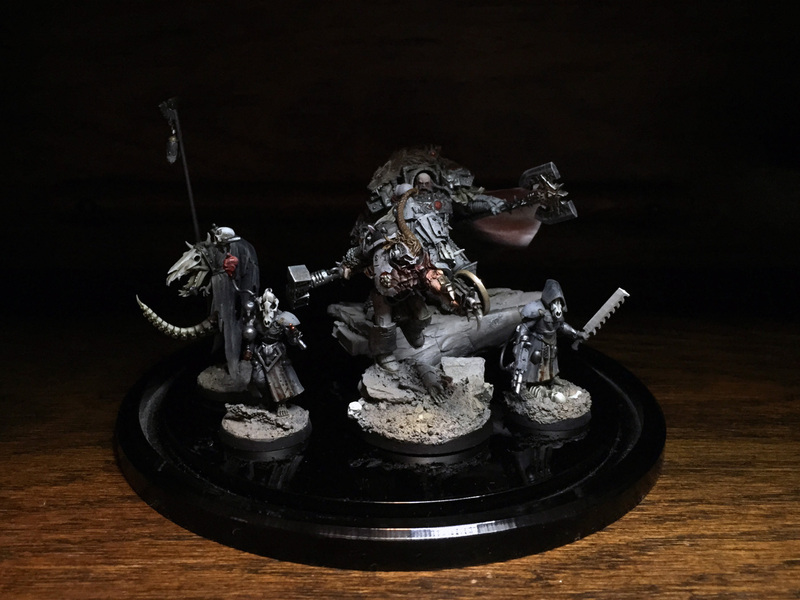 The Cairn Wraith conversion looks amazing, Migs. I’m planning to convert a box of Wracks into close combat servitors, so I’ve been looking forward to seeing what you did with yours. Top stuff as always. Very atmospheric! That chalky grey clothing looks ace, how do you do it? I’ve never managed something like that so I avoid that color spectrum. Super simple. Black primer and sand colored oil paint thinned with odorless turpentine. Very liberal, relaxed and all the time in the world to get just enough highlight and dust where you need it. I’ve been using a lot of oils in this project. They take ages to dry and then need a coat of varnish before further steps, but oh boy do they give you new tricks, smoothness and time to try! These look amazing, like they stepped off the pages of Prospero Burns. I really like the combination of bits you have used, especially the animal skulls. The color scheme is well thought out and applied as well. You can definitely tell that you have a fondness for the Alpha Legion though. I think you meant to say Vulkan instead of Alpharius for the Wolf Priest. Unless you have a really big surprise in store. Migs, these Bone-crafters are crazy good, such an eccentric and wonderful take on the Fenryka. Really like the Cairn Wrath conversion – But my favourite is the Ogre/Ogryn(?) based gun servitor with his little hydraulics and bull skull mask. Oils are amazing – as you said, take a bit to dry, but so much work time! Thanks mate! The fat guy is actually a Blight Knight conversion. 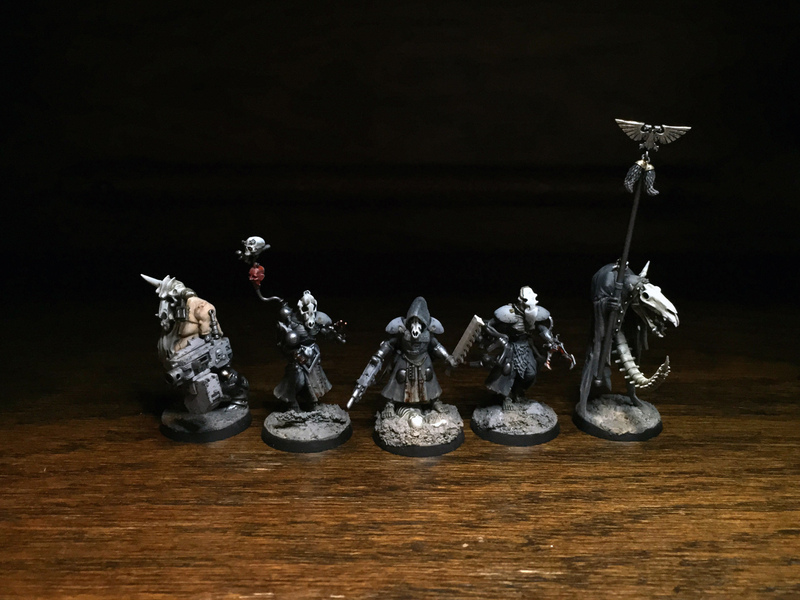 Such amazing models and had to join the fun. Ah, the Blight Kings – I see it now. Thanks! Are these mechanicum aligned with the wolves or human thralls with masks? They look a bit of both so wasn’t certain. But really great, can’t wait to see the vulkan conversion. I believe Thralls in the Fang are humans who didn’t make it throughthe trials. And the Iron and Wolf Priests made them into tools and warriors. Beautiful! Even more monochromatic than I was expected and all the more powerful for it. Painting all the bare wrack flesh black like the cloth works surprisingly well. I can’t wait to see the other thrall groups. 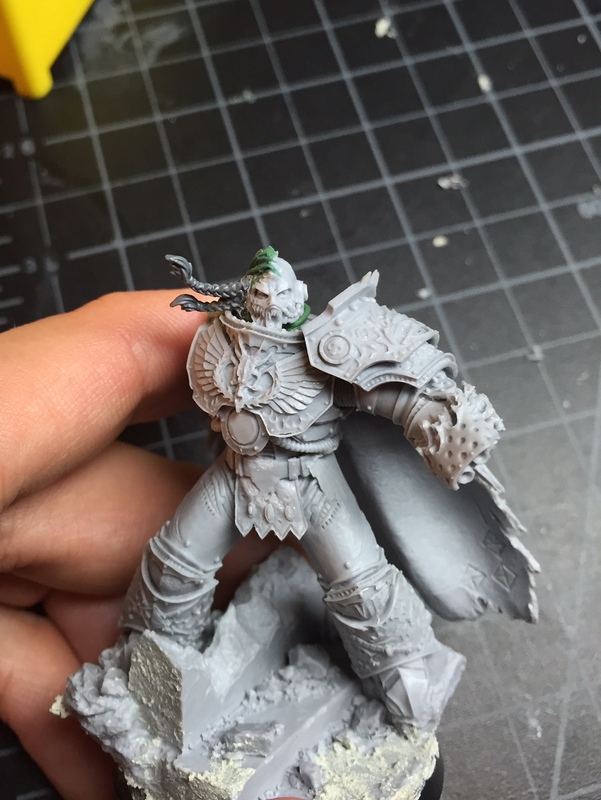 And the flesh mask on the Vulcan conversion is so creepy and perfect. Great looking models all around! They provide excellent contrast to your Space Marine models. Simon Egan’s model of Vulkan is massive. 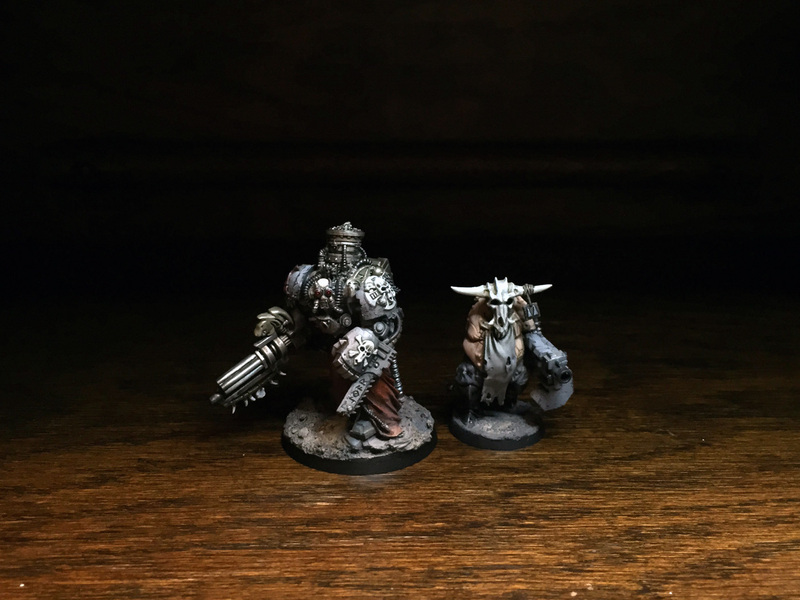 If you are worried about his size, maybe you could make him a champion or another chapter master (instead of the master of the bone weavers)? The Gal Vorbak heads work quite well for your purposes, the bestial look suits the Space Wolves well (particularly those amidst the Warp for so long). I like how you removed those little armor plates on his thighs. That should give you much more room to add other details and equipment to his belt. What do you think you want to do with the arms? I think the wrist-mounter flamer needs to be heavily modified if you want to keep it, otherwise you run the risk of it looking a little too much like Vulkan. Those thralls are looking great, there’s a really nice variety of shape and size. 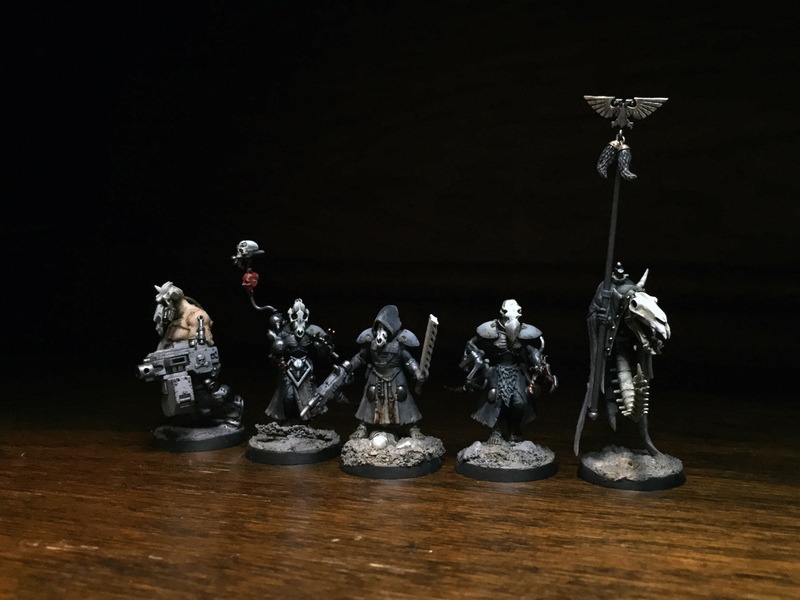 You’ve mentioned how gargantuan the Vulkan model is (I really hope you keep going with the model, as your flesh-maker really is a great conversion in the making), but to help explain the scale difference, I was hoping you might show us the Legion from Shaddes of Greye alongside the new Space Wolves. Whatever you do, keep up the good work! Will do that at some point. 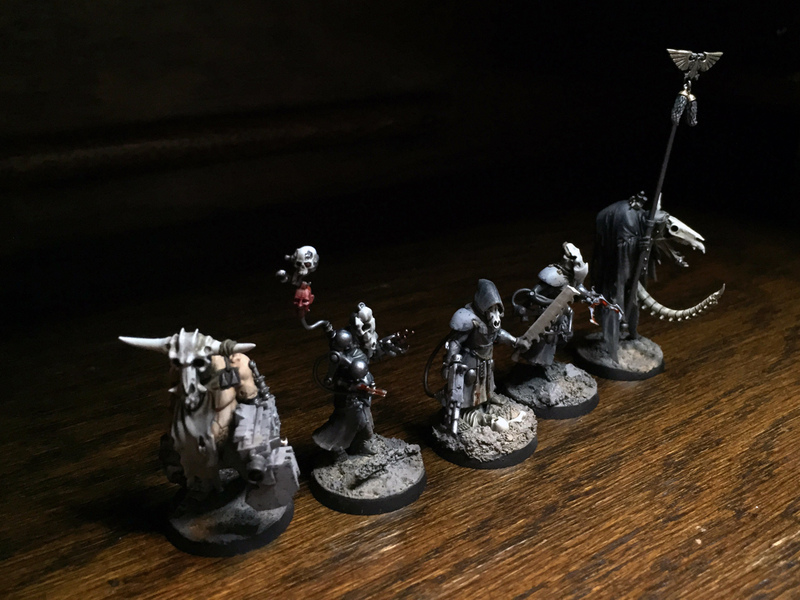 Oh my these are the most sinister models I have seen in a long time. 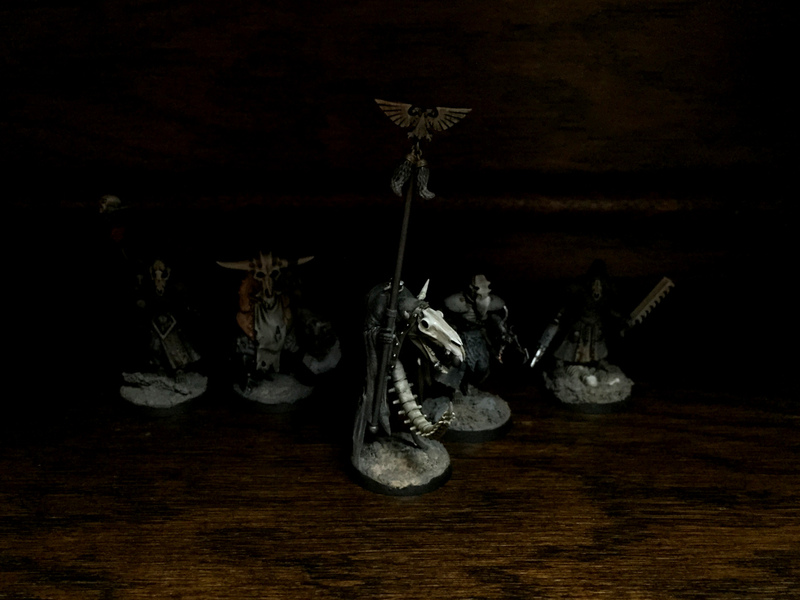 I cannot believe the wonderful effect you’ve achieved on the black cloth with simply black spray and a sand coloured oil wash. I hope you make loads more of these Thralls. Really looking forward to seeing these up close in the summer. Thanks mate 🙂 i cant wait to catch up! !